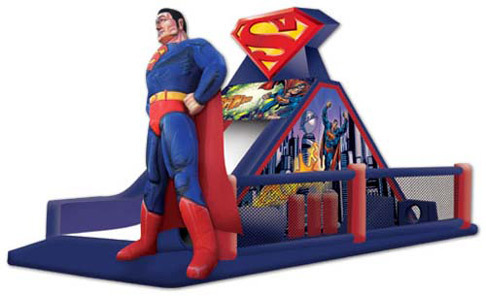 The licensed Superman challenge inflatable obstacle course leaves no doubt this is a challenge for Superman! With its oversized three-dimensional Man of Steel entrance, citizens of Metropolis will come in droves to discover this challenge obstacle. Comic fans of all ages can take part in several challenges with their favorite super hero, enjoying digital graphics with Superman in flight. 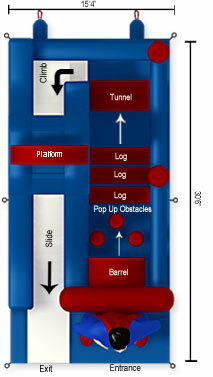 In addition to the 3D of superman, the top of this inflatable offers a 3D version of Superman's signature "S." The inflatable begins with a front-loading obstacle entrance, taking participants through tunnels and pop-ups to facilitate maneuvering skills and build confidence. The challenge obstacle then leads to an exciting front-exiting climb and slide, all to guarantee hours of enjoyable physical activity.